On Wednesday, June 28, The Valentine Eastern Sierra Reserve hosted its first public talk and tour of the summer. The topic was the human history of Valentine Reserve and of Mammoth Lakes. Except for these talks and kids summer camps, the property is typically closed to the public. According to Director of Outdoor Education Carole Lester, the talks were initiated to dispel the secrecy associated with the property. The Valentine Eastern Sierra Reserve encompasses 156 acres of largely un-logged and ungrazed “pristine sub-alpine forest.” The property extends from Old Mammoth Road, about halfway up Panorama Dome, and out across Sherwin Meadow to Lake Mary Road. The University of California at Santa Barbara (UCSB) acquired the property from the Valentine family in 1973. According to Lester, the family could have sold it for millions. The property is comprised of woodlands and meadows interspersed with a few trails and several log cabins that date back to 1921. Presenter Noelle Deinken told talk participants that, until the 1920s, the Paiute people used to manage Mammoth’s forests using prescribed burns to encourage the growth of certain plants for food and other resources. Lester said the forest was maintained at about 200 trees per acre. Most of the forest around Mammoth Lakes now has a density of about 900 trees per acre. Over the last ten years, Valentine has pruned back its woods to be somewhere in between, but Lester told walk participants that this was about as close as one can get to what the Sierra’s forests looked like one hundred years ago. She showed participants a massive Jeffrey Pine, from which core samples have been taken that indicate the tree is more than 500 years old. 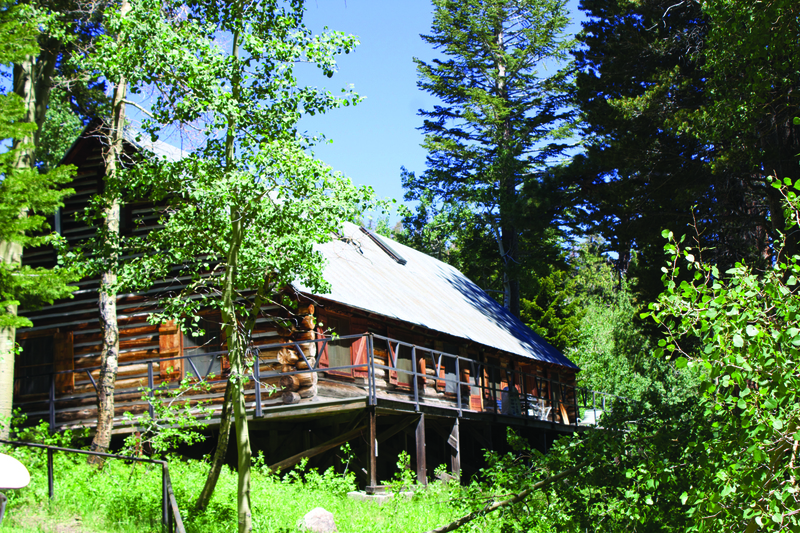 The property was originally owned by an Owens Valley rancher named Thomas Williams. Williams purchased the 156 acres that now comprise Valentine Reserve from the Federal Government in 1897. According to Deinken, at that time, the settlement at Mammoth was comprised of one hotel, a garage, a post office, and a bakery, with a few caretakers who lingered through the winter to take care of properties. Supplies were delivered by sled from Bishop, and horror stories circulated about people being trapped in their homes after large winters and requiring rescue by good Samaritans. Prior to the construction of Highway 395 in 1937, the only way to get to Mammoth Lakes was to drive from Los Angeles to Mojave, take the train from Mojave to Lone Pine, take a coach from Lone Pine to Swall Meadows, and ride by horse from Swall Meadows past Casa Diablo Geyser to Mammoth Meadow and the mining towns behind it.